The north west corner of Spain which is the region of Galicia has lush vegetation and much woodland of oak, pine, and eucalyptus. The coastline has many deep inlets known as rías the source of much of the excellent local seafood. There are also many unspoilt villages and beaches. The farmland has been divided into many very small fields over the years with stone walls where you are unlikely to see machines at work. You may also see carts with solid wooden wheels being drawn by an ox. Though Galicia has been a poor region of Spain, it has benefitted more recently by improved roads making it easier for the tourist to travel the area. The city of Santiago de Compostela is said to be one of the most beautiful cities in Spain and has been a tourist destination for a long time due to the shrine of St James the Apostle. Pilgrims have made their way from across Europe for hundreds of years. Galicia has 2 National Parks, The Dunes of Corrubedo National Park an important sand dune complex on the west coast, and The Islas Atlanticas National Park, four groups of islands off the south west coast of Galicia with an important sea-land ecosystem supporting many colonies of birds. 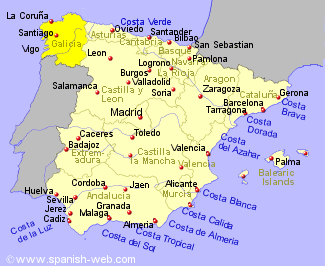 We have self catering holiday rentals in La Coruna in or near the following towns.